A paintball bachelor party in Minnesota is the best way to party with friends before the big day. It’s the greatest thing to do that will be a lot of fun for the whole crowd. By using a paintball gun a person has the freedom in the great outdoors to experience the unusual, yet exciting atmosphere. Whether you invite a large crowd or a group of eight; you will have fun. Each person takes the paintball outside, aims at their specific target, and a splash of bright color sprays through the air. Whether red, green, purple, yellow, or blue, the paintball exhibits the display. After a while, the whole party of guests will be covered head to toe in paint that is easily washed out of clothing. A paintball bachelor party in Minnesota is about color, excitement, new beginnings, new atmospheres, and a whole new way of life. The friends of the bachelor already know this; and they are out to achieve their purpose. They want to exhibit strong implications to the bachelor before he becomes the groom. Once he does, all these things will happen in his life: new color, new excitement, new beginnings, and new experiences that will splash across his life. 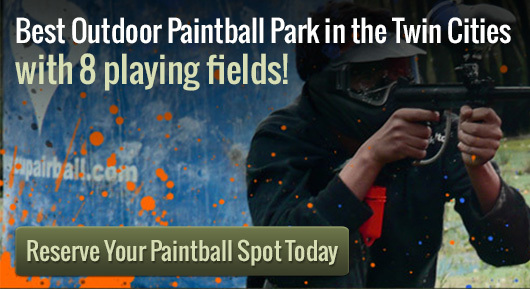 Action Packed Paintball is open Saturdays and Sundays for walk-on play; however a reservation can be made for parties such as bachelor party in Minnesota. Plus, there is a place to eat, and other activities on location. This is a great way to celebrate and enjoy the outdoor atmosphere. Intriguing and enjoyable, and satisfying; friends of the bachelor can feel right at home knowing everyone will have a good time.